Watch in this video as Restoration Pro 24 technician removes difficult grease stains from light carpet. This is a step by step carpet stain removal process. Watch the Restoration Pro 24 technician remove a candy stain from light carpet. Candy stained carpet can be very difficult to get clean. The candy colors can be difficult to remove from carpet fibers. One of the most difficult stains to remove from carpet is grease. Dark black carpet stains are commonly grease stains and people don’t even realize it. Grease stains in carpet typically are a transfer from shoes, kids toys, furniture, pets, ladders and tool boxs. In today’s article we are going to learn a quick 3 step process for removing difficult grease stains from carpet. This 3 step process works on most all types of carpet but it is always good to make sure that you check the manufacturers specification to be certain not to void the carpet warranty. 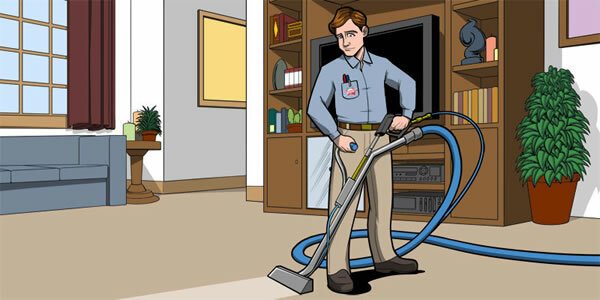 The required tools and products for this job can be found at a carpet and upholstery cleaning supply store. 1A. In a 1 quart spray bottle mix a quality carpet safe dry-cleaning solvent that evaporates completely leaving no residue with clean soft water. The mixture should be 2:1 water to solvent. Apply the carpet cleaning solvent mixture in a heavy mist to the affected area. 1B. With a dry white cotton cloth blot the affected area of carpet transferring the grease stain from the carpet to the cloth. Repeat this process until nothing is transferring to the cloth. 2A. In a separate 1 quart size spray bottle mix a quality plant-based traffic lane pre-conditioner with water. The mixture should be 1gal water to 6oz of carpet conditioner. Once you have your solution mixed add 2oz of a Natural Citrus Organic Solvent Degreaser. Make sure the degreaser is biodegradable and 100% environmentally safe. 2B. Using the cotton cloth from step 1B agitate the affected area in a circular motion for about 20 second. Now the stain should be loosened from the fibers and ready to be extracted. With a hot water extraction machine rinse and vacuum the affected area until carpet stain is no longer visible. Be certain to rinse with water that is greater than 200 degrees (F). Rinse thoroughly to be certain that all chemicals have been removed from the area. Left over chemicals can leave a crusty residue. If the stain is not yet removed after this process you should dry and vacuum the carpet. Repeat steps 1-3 to see if results can improve. The quality and type of carpet may not allow you to get this stain out. For more information and how to videos about removing carpet stains we recommend to visit restorationpro24.roofingbrand.com. Additional helpful information can be found in the articles sections by clicking here. If your home is in need of quality carpet cleaning and stain removal call Restoration Pro 24. The professionally certified carpet cleaners will refresh your carpets and remove stains.